Recently I have shared Stitched ribbon menu in different styles and before that I have shared many types of menus like horizontal responsive jquery menu, vertical responsive jquery menu etc because a menu is very important for a clear navigation and for a blog's traffic because search engines like only these blogs and websites which have clear navigation. A blog with clear navigation also helps users to reach the content easily which they are looking for and it has a good traffic too. Though blogger is a good platform to create a free website/blog and it has many features but the only problem with blogger is it doesn't have menus and some other basic gadgets like related post gadget, follow buttons etc so if a blogger wish to have a menu in his blog he have to get it from other websites. A blogger having knowledge about CSS and Html can create a his own menu easily and can add it from other websites also but those who don't know CSS and Html can't do that, they need a step by step tutorial to add a menu in their blogs. So I have shared almost every type of menu with step by step tutorials for those who don't know programming so they can use these tutorials to add desired menus in their blogs. In this post I am sharing an accordion menu with step by step instructions to tell you how to use this menu in your blog but before that i will tell you what an accordion menu is? In this post I will share different types of accordion menus just like above one. Choose the one which you like and follow below steps to add it in your blog. Step 1: Go to blogger dashboard and select layout in menu. Step 4: Click on save and move to next step. Step 6: Click on save, now we have to add CSS code to decorate this menu so go to template and click on edit Html. Step 7: Click anywhere in the Html code and search for </head> by using Ctrl+F on your keyboard. Step 9: Search again for ]]></b:skin> by using Ctrl+F on your keyboard. Step 10: Copy below code and paste it just above ]]></b:skin>. Step 11: Click on save template and you are done. To customize this menu scroll down and read customization part of second menu. Step 1: Go to blogger and click on layout. Step 4: Click on save and click on add a gadget again. Step 6: Click on save and go to template. Step 7: Click on Edit Html and click anywhere in the Html code. Step 10: Click on save template and you are done. Although you can customize this menu but do it only if you have knowledge about CSS otherwise this menu may stop working. Here I will just tell you how to add or remove tabs in this menu and how to put links in tabs. Similarly to remove an existing tab just remove code of the tab for example you want to remove New tab from menu now just remove <li><a href='#'><span>New tab</span></a></li> and you are done. To add link in a tab replace # with your link. For example if you want to add homepage link to home tab then replace # in <li class='active'><a href='#'><span>Home</span></a></li> with homepage link of your blog. Step 1: Go to blogger dashboard and select layout in blogger menu. Step 4: Click on save and go to template. Step 5: Click on Edit html and on the Html page search for ]]></b:skin>. Similarly to remove an existing tab just remove code of the tab for example you want to remove New tab from menu now just remove <li><a href="#">New tab</a></li> and you are done. To add link in a tab replace # with your link. For example if you want to add homepage link to home tab then replace # in <li><a href="#">Home</a></li> with homepage link of your blog. This menu is fully responsive. It has sub dropdowns which opens on mouse hover. 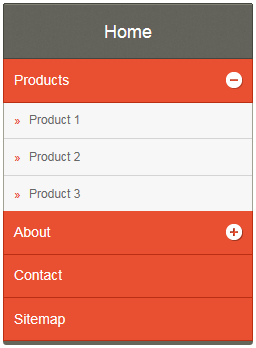 You can see its demo as well as learn how to add this fully responsive accordion menu in blog. - To add a new single tab without any dropdown use the below code. I hope you like this post and all the menus works on your blog, if you have any problem feel free to ask me in comments or contact me. Follow and subscribe to get instant news about blogger menus in your inbox. If you have any suggestion or opinion leave a comment below. Share this post with others if you like it. Search tags: Blogger menu, menus for blogger, stylish responsive menu for blogger, vertical menu for blogger, accordion menu for blogger, collapsible menu menu for blogger, menu which can be expand and collapsed, CSS menu for blogger, vertical menu with responsive design for blogger, 101Helper blogger menus.